fiberglass frp grating is manufactured by laying continuous glass fibres in the mould in the direction of vertical and horizontal, and thurougly wetted out with resin, layer by layer. When the weaving process is completed, the mould is heated to cure the panel. After curing, the panel is ejected from the mould. The standard panel would have meniscus (concave) top surface. Any process such as post applied grit could be bonded after as a secondary operation. This continuous process produces an integral, one piece panel, which offers excellent corrosion resistance as well as bi-directional strength. 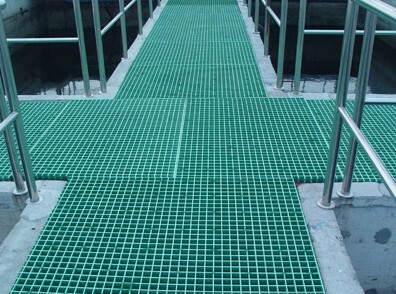 Fiberglass grating in cooling tower main used for platform, it is non-slip and preservative.